Premium Quality Birch Rustic Edge Countertop. Quote and order any size online! Fill in the dimensions below and options below. Individual Birch boards can vary in tone from a pale eggshell to a cinnamon color, depending on the cut. Birch creates a warm, light surface with a satiny sheen. The grain itself is most often straight and consistent, but some rippling can occur as well, adding depth and beauty to the surface. Are you looking to add a natural element to your kitchen? Our Rustic Edge countertop gives the appearance of a live edge countertop with the strength and quality you have come to know from Country Mouldings. The rough edges of the countertop are expertly crafted by a skilled woodworker and simulate the natural shape of the tree. The Country Mouldings Rustic Edge countertop is the perfect choice to introduce nature into any style of kitchen from modern to country. By recreating the appearance of the natural curve and form of the wood, we are able to showcase the beautiful, organic lines as well as highlight the natural grain, making your countertop one of a kind. The Country Mouldings Rustic Edge countertop starts out as our rectangular, plank style countertop. 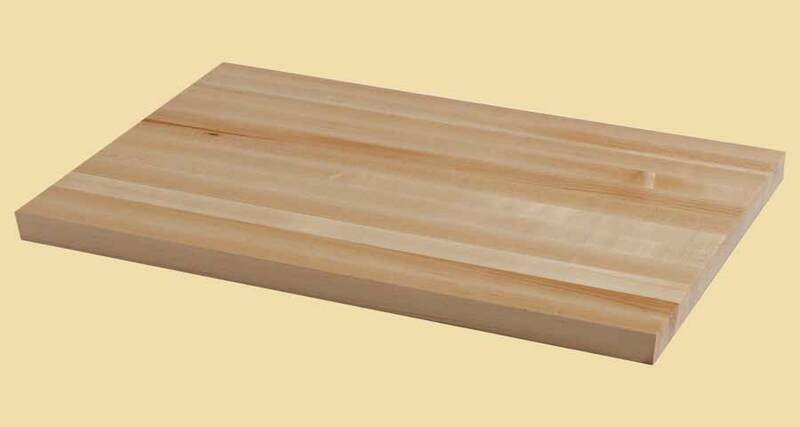 Wood boards made from FAS and Select grade lumber in varying widths are glued together. The boards are then skillfully cut on the edge up to 1” depth to give the appearance of a live edge countertop. The ordered size is the maximum overall size and the dimensions may decrease up to 1" all around. 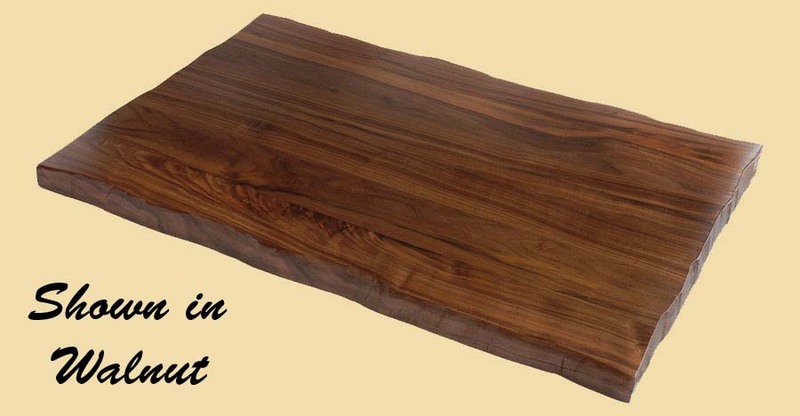 For example, a rustic edge countertop that is ordered at 24" x 60" may have a 22" width and a 58" length in some areas. 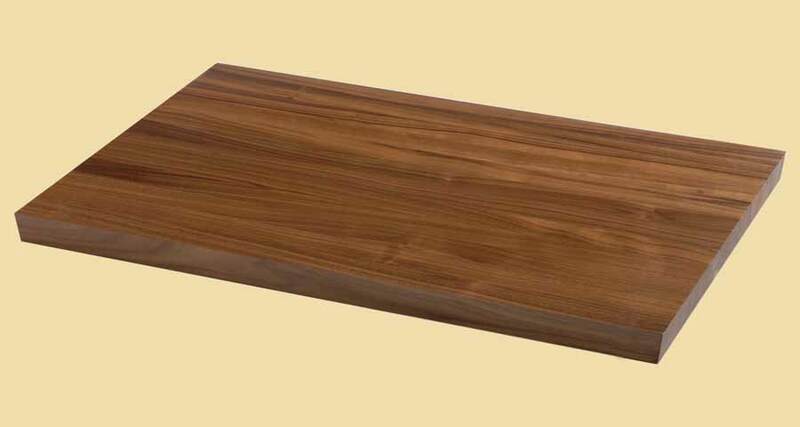 The planks on your countertop will vary between 3" and 6". The first and last plank may be less than 3". The unique look of the Country Mouldings Rustic Edge countertop is certain to be a conversation piece in any kitchen. We make the process of ordering your new custom countertop simple. With just a few measurements and a few minutes in our online store, you can be on your way to having a one of a kind countertop for your kitchen. Please note that because of the unique design of the countertop, the sides and edges of the piece can be porous and rough even after a finish is applied. It’s important to take into consideration the needs of your kitchen before choosing a countertop and finish that is best for you. Unfinished: Your block will not have a finish when you receive it. Please apply any appropriate finish for your application. Mineral Oil: This is the correct choice if you will be preparing or cutting food on your countertop. We apply two coats of food grade mineral oil to all surfaces. You will need to reapply food safe mineral oil on a regular basis. Conversion Varnish: This 45 sheen semi gloss finish is beautiful and durable. We apply three coats of our catalyzed conversion varnish to the top surface and two coats everywhere else. It does not require regular reapplication. Conversion varnish is not appropriate if you will be preparing or cutting food on the countertop. Note: The picture on this page shows a prefinished rustic edge countertop. It is meant to show the rustic edge. It does not necessarily show the wood or finish you will receive. Unfinished rustic edge countertops ship in two weeks. Prefinished ship in three. Dimensions: 1" x 12" x 24"